By the benign blessings H.H Shrimath Sudhindra Thirtha Swamiji, Mathadhipati of Shree Kashi Math Samsthan, the Chaturmas Vritha of Vijaya Nama Samvatsar was observed by their Patta Shishya H.H. Shrimath Samyamindra Thirtha Swamiji at Bangalore Shri Kashi Math with all religious fervor, pomp and gaiety. 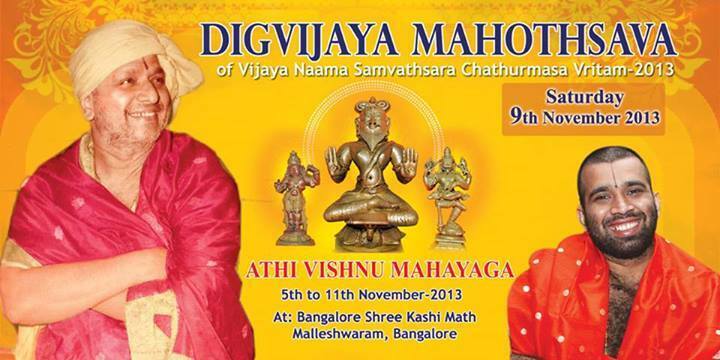 To invoke the blessings of Shri Hari-Guru, ATHI VISHNU MAHAYAGA will be held for the first time at Bangalore Shri Kashi Math, between 5th to 11th November, 2013 and to conclude the Chaturmas Vritha a befitting “DIGVIJAY MAHOTSAV” is organised on Saturday the 9th November, 2013 at 6 pm and to invoke the Ashirvachan of Revered Gurudev a MAHASABHA will be held on Sunday the 10th November, 2013 at Bangalore Shri Kashi Math, Malleshwaram, Bangalore. All are cordially invited for participate in the above festivities and to partake prasadam from Revered Swamiji enroute the Digvijaya Procession to invoke the blessings of Shree Hari-Guru. 11th November, 2013 1.00 pm Maha Poornahuthi for Athi Vishnu Mahayaga by the divine hands of His Holiness Swamiji.